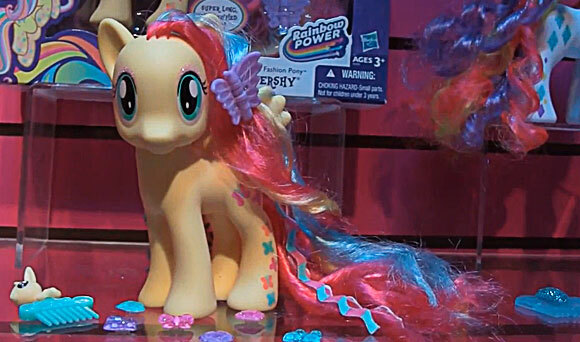 Hasbro reveals all new My Little Pony themed merchandise at Toy Fair 2014. 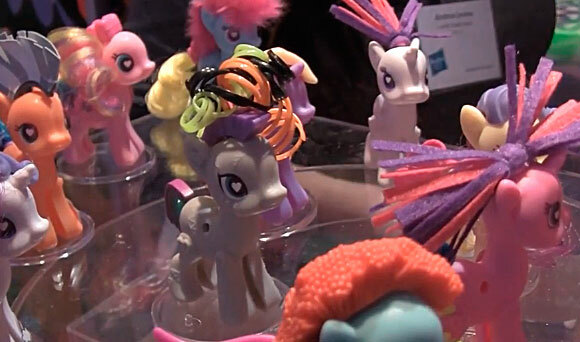 Hasbro showed off their My Little Pony toy line at the 2014 Toy Fair. The animated series is in its fourth season and the theme this year is Rainbow Power. Twilight Sparkle is getting her very own Rainbow Kingdom. The first thing we noticed is that the entire lineup of ponies has been “rainbowfied”. Want to see even more cool toys? 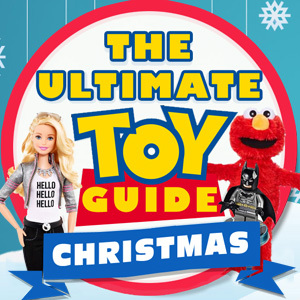 Check out our most popular Gift Guide on the top toys for 2016 for christmas. For 2014, it is all about the rainbow as all of your favorite ponies and play sets have been brought to life in dazzling rainbow colors. The rainbow theme extends across the whole toy line. Overall, there looks to be quiet a selection of My Little Pony toys for 2014. Some of the ponies have glimmering wings and there were even prototypes of see through ponies that act like snow globes. Here are some of the newest toys in the line that are sure to excite fans of the series. 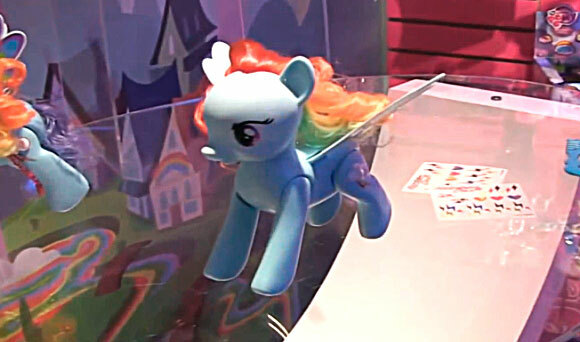 One of the most popular toys in the line in the spring will be the Flip N World Rainbow Dash. We all know that Rainbow Dash is the fastest flying Pegasus in Equestria. 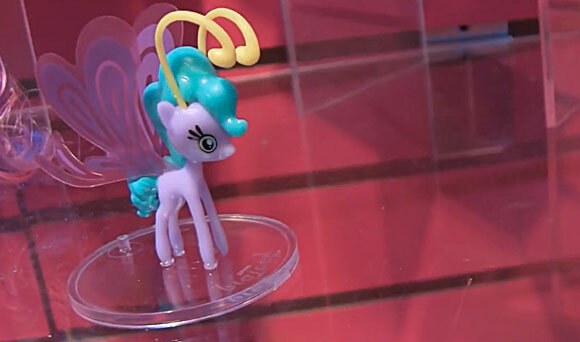 Now we are getting an interactive toy that sports her iconic cutie mark. Press it to hear fun phrases like “I’m Rainbow Dash. Watch me flip.” The coolest part is that you can press down on her to make her sit down and she will pop back up, flipping like a gymnast. For girls that love hair play, they are going to love the My Little Pony Friends Styling Strands Fluttershy and Rarity. Fluttershy will be available in the spring and Rarity will be available in the fall. These ponies sport super long hair, which is perfect for styling with sparkly gems, berets, and clips. In addition to hair play, there was also a version of Twilight Sparkle in the fashion line that featured dress up play. One of our favorite new ponies were these cute multi-character packs called Breezies. These collectable ponies fit snuggly inside a cute little locket. In the animated series, Princess Twilight Sparkle is getting her own rainbow kingdom. The best way to live out the new storyline is with the Princess Twilight Sparkles Friendship Rainbow Kingdom. This 3 floor palace allows girls to use fashions keys to pop open magical accessories, including a vanity, wardrobe, book, and treasure. 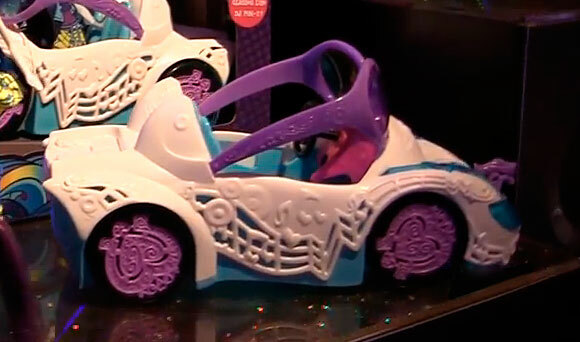 It comes with a rolling cloud car that that slides down the fun swirly slide. The castle comes to life with a swing, golden balcony, and lookout tower. It comes with a special edition version of princess Twilight Sparkle. It’s for ages 3 and up and will retail for $39.99 when it hits in the fall of 2014. 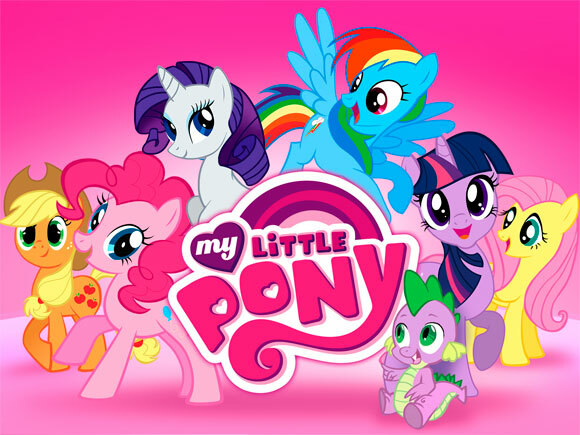 Hasbro is introducing a brand new exciting segment in my Little Pony called My Little Pony Pop. It’s a totally new way to play. It allows girls to design their own ponies. It’s like the first step in construction. It starts with ponies in a frame. First, you snap the pony out of the frame. Then you pop the two sides of the pony together. Then the fun begins. You can personalize your pony with an assortment of tails, wings, hair, and even customizable cutie marks. Give your pony fuzzy hair or spiral ribbon like hair. Whether you choose a far out style or a more conservative look, it’s all up to your imagination. You can even decorate your pony’s body with stickers. There are play sets at every price point starting at $3.99 and they will be available in the fall of 2014. Decorator kits offer accessories. Deluxe kits come with a bracelet that contains interchangeable gems. We think that kids will love using their creativity and imagination with this line. The Ponies also need a place to play. Pinkie Pie’s Sugarcube Corner play set looks like it’s made out of candy. 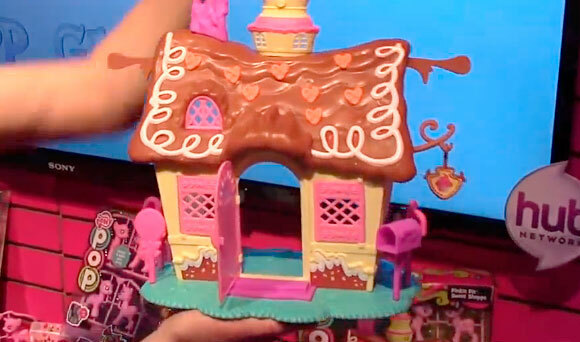 The chocolate frosted roof and cupcake tower looked so yummy that you almost wanted to eat it. This 2 floor play set features the same fun as the My Little Pony Pop figures. Girls can assemble their own play set with windows, flower boxes, and interchangeable doors. All of the pieces are interchangeable with other play sets in the line. The best part is girls can decorate the set with stickers. The play set is designed for children 4 and up and retail for $19.99. It will be available in the fall of 2014. And that’s My Little Pony Pop. The Equestria Girls were launched last year. These dolls transformed ponies into girls. The dolls sold remarkably well. The Rainbow theme will extend across the entire Equestrian line. The most exciting Pony news to come out of Toy Fair was that we are getting another movie, Equestria Girls Rainbow Rocks. There will even be brand new characters. Though very little information was revealed about the film, we know that the film culminates with a Rock “Mane” event. 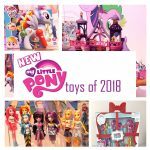 Fans of the new movie will love the My Little Pony Equestria Girls Dolls That Rock collection which includes Pinkie Pie, Twilight Sparkle, and Adagio Dazzle. These dolls come to life, singing a song when either you or one of their doll friends gives them a high five. The dolls come with fashionable accessories and going with the rock theme come with a musical instrument. The dolls are for girls ages 5 and up and will retail for $24.99 when they are released in the spring of 2014. There is even a main event stage play set which includes Pinkie pie and her drum set. We also caught a glimpse of the DJ Pon-3 Rocking Convertible. This stylish vehicle allows you to arrive at the concert in style. It features a wind shield shaped like DJ Pon-3’s signature glasses. However, you can actually detach them and put them on, which girls will find pretty cool. 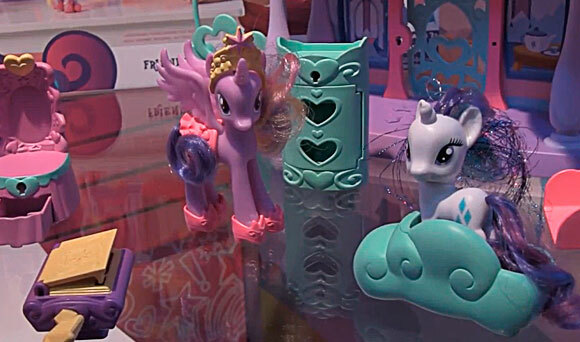 There were also a ton of licensed My Little Pony products on display at Toy Fair 2014. Hasbro showed off the My Little Pony app, website, and leapfrog app. From plush, to apparel, to gaming, to toys, there was something at Toy Fair 2014 for Pony fans of all ages. 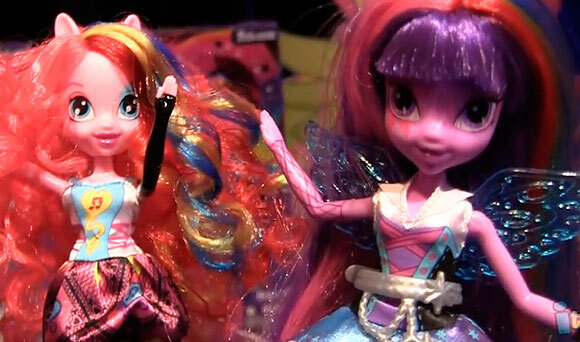 What was your favorite My Little Pony themed item at Toy Fair 2014? Do you know when the BREEZIES will be released? Fall or spring? we just saw the episode this past wkend and found an old breezie at a flea market. My 5 yr old is looking for them. TIA! We can’t wait for the Breezies too. They will be available sometime in the Fall.